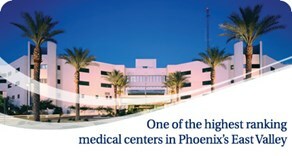 Banner Desert Medical Center is the largest, most comprehensive hospital in the East Valley of metro Phoenix. The campus has 669-bed private rooms, with 248 beds dedicated to children (Cardon Childrens Medical Center). There are currently 1,200 physicians representing 65 specialties. This 80-acre medical campus includes one of the largest and most comprehensive Cardiac Care Programs in Arizona; a Women's Health and Wellness Center with a Level III designation for obstetric, prenatal and neonatal services; a Cancer Center that is the largest provider of cancer care in the East Valley; and 53 Critical Care beds, including 7 CVICU beds, a 22-bedmedical ICU and a 24-bed surgical transition ICU. OR Services, the busiest ED in the state, an Ortho & Sports Rehab Center and an impressive Medical Imaging department all demonstrate Medical Excellence..
As one of the largest acute care facilities in the East Valley, Banner Desert offers state-of-the-art technology in all departments, from our two da Vinci Surgical robots to our 3D cancer technology. Our campus is also host to iCare, a telehealth program that provides an extra layer of monitoring for patients in intensive-care units at Banner Desert and throughout the Valley at other Banner hospitals. To balance our high-tech campus, Banner Desert also offers unique integrative therapies, from Dog Therapy, Music Therapy and Massage Therapy to The Oasis Spa, a hospital-based sanctuary offering a team of highly skilled, licensed practitioners who will assist you in reducing stress, renewing energy and restoring a sense of well-being. Banner Desert employs more than 3,700 health care professionals and support staff. The facility has a medical staff of more than 1,200 physicians representing 65 specialties. Founded in 1878 by Mormon pioneers, the city of Mesa was built on a plateau overlooking an expansive valley. The word mesa has it origins in the Spanish language and its literal translation is "table top." The city is located just 15 miles from Phoenix and is home to more than 430,000 people. The city has numerous historic areas including the Temple District. This area of town surrounds the Later Day Saints(LDS or Mormon) Temple, which was built in 1927. The temple and its visitor's center attract more than two million visitors each year. ?Other area attractions include the many museums and art galleries, year-round golfing, and historic Hohokam Indian sites. Spend an evening with the Mesa Symphony Orchestra or attending a play performed by the Southwest Shakespeare Company. If you like baseball, Mesa is the spring training home of the Chicago Cubs. Nearby areas offer mega shopping malls, numerous factory outlets, wonderful restaurants of every sort, dozens of top-rated golf courses, Indian gaming centers, medical services, and many more attractions including Biosphere II, Boyce Thompson Arboretum, the Arizona Science Center, Kartchner Caverns, Saguaro and Canyon Lakes and of course, the beautiful Grand Canyon.